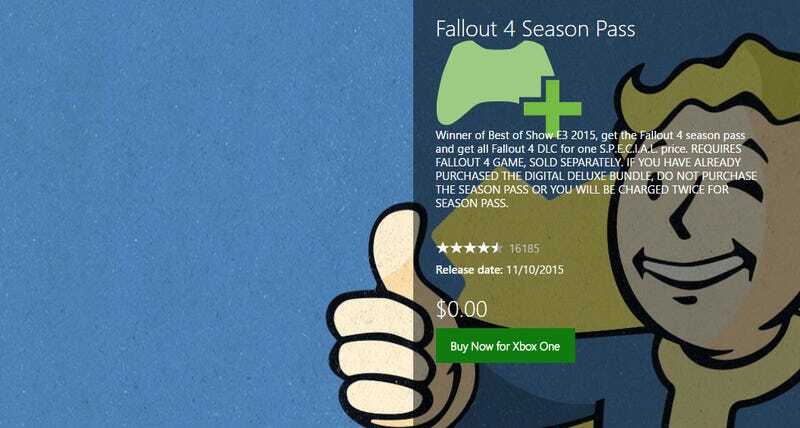 A likely pricing error on the Xbox Store today meant that both Fallout 4 and its season pass were selling for the princely sum of $0.00 [Update: the free copies are being revoked]. UPDATE: Microsoft has revoked the license of every copy of the game/DLC that took advantage of the exploit. However, the company will be giving everyone who tried it $10 in their Microsoft accounts for the “inconvenience”. ORIGINAL STORY: Suspecting it was just a listing error at the front of the store, I added both to my cart expecting to eventually run into the correct price, but nope, turns out they really were free, because they’re now both in my Xbox One library without me paying a cent. It also, as you can see from this listing on the Xbox Store’s website, applied to the game’s other DLC.